I’ve been involved with Familylife for two and half years. Over that time I have learnt something really important about how my husband and I communicate. Dave is an internal processor, he thinks carefully before he speaks. This plays out especially in meetings. When he speaks, people listen because they know he usually has something valuable to say. By working through the Together material we have realised our different styles and how that affects our relationship. For example if I’m toying with the idea of a weekend trip to see an old friend, I’ll tell Dave at the first opportunity. I’m thinking that we’ll discuss it together and then make a good decision. If Dave wants to go for drinks with colleagues after work, he will consider carefully the impact it will have on me and weigh that up against the benefit to himself before making a decision. After that he may or may not talk to me about it. For years we assumed that the other was doing the exact same thing we were. Our differences really came home to me one night when we went out for dinner for Dave’s birthday. I jokingly said “So, you’re 36 how does it feel?” Dave’s reply “I don’t always like birthdays. It makes me feel that’s another year gone by and I didn’t get to do any of the things I wanted to do.” My jaw dropped. Now, Dave wouldn’t mind admitting he does have tendencies towards procrastination. Added to that we have a pretty busy life with work, church and four children, so I wouldn’t want to take full responsibility for Dave not getting to do stuff he wants to do. But this was certainly a wake up moment for me. I didn’t want Dave to feel like that and I questioned why he felt like that and I didn’t. We chatted a lot about what Dave said that night, but it wasn’t until we worked through the Together material that the penny dropped. Our communication styles were so very different and we both thought the other was doing the same as us. So I started to encourage Dave to share some of the things he wanted to do. 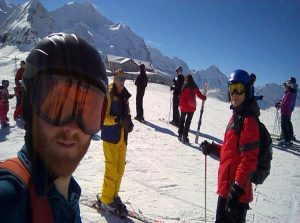 I knew that one thing he really fancied was going skiing and as I have no desire to go on a ‘holiday’ where I get cold, scared and bruised, I suggested he plan a trip with some friends or family. Through Together we realised that we were at opposite ends of the communication spectrum and that simple realisation changed us. I suppose you could say that we have both come a little more towards the centre point, where I think more about what Dave needs and he speaks more about what he wants. Trouble is now we’ve started something, Dave loved the trip so much he wants to go again next year!